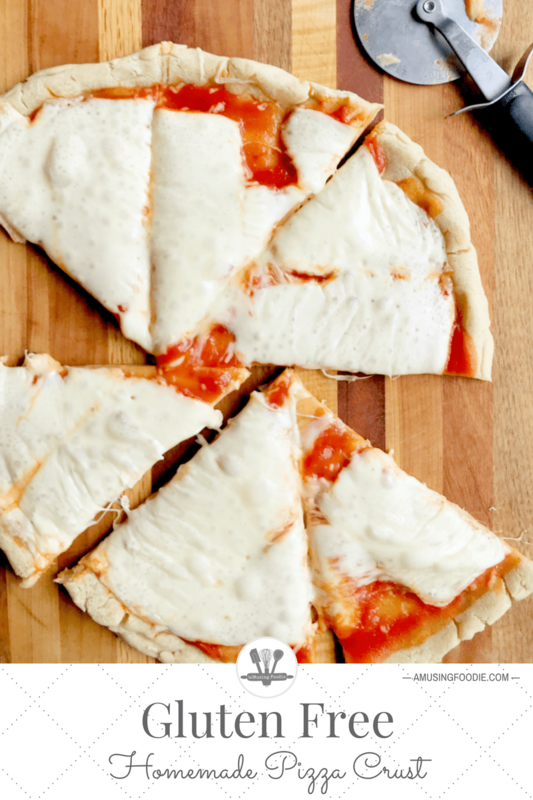 This homemade gluten free pizza crust is really simple to make! I’m finding myself in the position lately of having to create gluten free recipes on a fairly regular basis for friends and family. While I don’t eat a gluten free diet personally, I appreciate the fact that eliminating gluten has led to a better quality of life for so many people I know, and therefore, I’m game for cooking to meet their needs! Homemade pizza is a really fun menu item to feed a crowd because virtually everyone likes it and it’s simple to make individual or large pies, depending on preferences (dietary or otherwise). I have my go-to whole wheat pizza dough that works great with all-purpose or a blend, too. So I thought to myself: What if I followed the normal process, but subbed in a gluten free flour mix instead to make a homemade gluten free pizza crust? I’ve used Bob’s Red Mill Gluten Free All-Purpose Baking Flour before, but found myself with Bob’s Red Mill Gluten Free 1-to-1 Baking Flour in the pantry, so I decided to give that a try. 1. I pressed the dough into the pizza pan like a short bread crust and then pricked it with a fork. 2. I pre-baked the dough a little before adding sauce, cheese and toppings. The finished crust was tasty, better than anything frozen we’ve tried (which has been close to cardboard, honestly). It didn’t, however, hold up as good for next day leftovers, so plan to make enough for a meal on its own, as opposed to extras for later. Heat your oven to 170°F. As soon as it's done preheating, turn it off. Combine the yeast, sugar and water in the bowl of a KitchenAid mixer (or similar) fitted with a dough hook. Let it sit for about 10 minutes or until you notice the liquid looks foamy. After mixing the flour and salt together in a separate mixing bowl, add it to the water and yeast, turn the mixer on low for 30 seconds, and then increase the speed to medium-low for another minute longer. When the ingredients have come together, increase the speed to medium and drizzle in ¼ cup of olive oil. Let the mixer continue kneading the dough for 10 minutes. Remove the dough from the mixing bowl and shape it into a ball. Coat the dough ball with 1 tablespoon of olive oil, place it back in the mixing bowl and cover the top of the bowl with a towel. Set the covered mixing bowl in the warm oven for 1 hour. Remove the bowl from the oven. Heat the oven to 500°F. Cut the dough into 2 equal sized rounds. Press one onto a non-stick pizza pan, leaving a bit of a raised lip around the edge. Prick the top evenly with a fork, about 10 times. Add sauce, cheese and your favorite toppings. Cook the pizza for 5-6 minutes, or until the cheese is melty and the edges are golden. Let the pizza cool for a minute and then transfer to a large cutting board. Let the pizza pan cool and then repeat with the second round of dough.